Washington - John Kelly is expected to resign as U.S. President Donald Trump’s chief of staff in the coming days, CNN reported on Friday, citing unnamed sources. Representatives for the White House did not be immediately respond to a request for comment on the report. The rocky relationship between Trump and Kelly, 68, a retired Marine Corps general, has been widely reported. CNN, citing its sources, said their relationship was now worse than ever and that the two were not on speaking terms, but added that no decision on Kelly’s possible departure was final until it was announced. A source told Reuters last month that Trump was considering a replacement for Kelly. Vice President Mike Pence’s chief of staff, Nick Ayers, is a possible contender, the source said. Kelly had sought to bring more order and stability to a White House that has often been chaotic under the unpredictable Trump. Team Turmoil loses another Turkey. Who will take over? Duvid Duke from the KKK? Feh. You've already gotten Trump on you. The stench of uncontrolled greed and blatant corruption will follow you out the door. 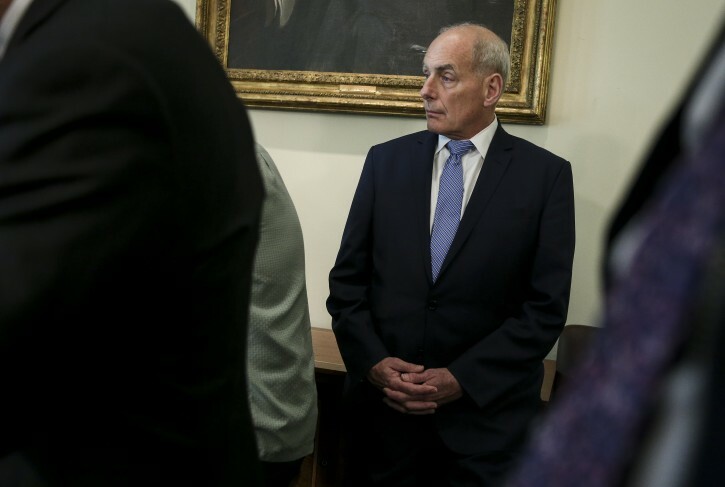 If TRump said that Kelly would be his Chief of Staff until 2020, then he WILL BE his Chief of Staff. You know i kind of finally agree with you. Noone denies that trump is greedy. eevn Trump will tell you that. Here is where we disagree. We don't care that he is greedy. I fargin him. Let him get rich as long as I get rich too. You liberals think making money is bad. its not. At the end of the day he is making america great again day by day. That's all that counts buddy. “ You know i kind of finally agree with you. Noone denies that trump is greedy. eevn Trump will tell you that. Yeah, you pointed out how well the Dow is doing as proof. LOL. National debt approaching a trillion which he thinks will be reduced solely through growth, trade deficit has actually widened. He also complained that the dollar was too strong during the campaign, then it got stronger so he bragged about it and took credit for it. With all that, I think he will be reelected which is fine if the alternatives are Warren, Booker, Gillebrand, Bernie or Beato. I would have like what he did the China if he had gotten the world on his side. Instead he alienated the E.U. and Canada as well as any country where the average skin pigmentation is between deep black and off-white. “ If TRump said that Kelly would be his Chief of Staff until 2020, then he WILL BE his Chief of Staff. Does the new guy have a high IQ? Is it higher than Kelly's? When you quote Donny Trumpy be prepared to eat your words. Would you like them with a side order of BENGHAZZI? Kelly was terrible. I for one am glad he's gone.